"When the going gets tough... the tough take the law into their own hands." 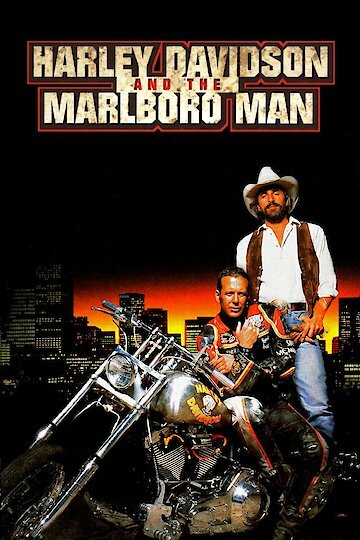 Harley Davidson and the Marlboro Man is a 1991 action thriller about a Harley biker and a cowboy who find themselves in deep trouble after pulling a daring bank heist. The film was written by Don Michael Paul directed by Simon Wincer. Harley Davidson (Mickey Rourke) and Robert Lee Anderson, also known as The Marlboro Man (Don Johnson) are two unemployed buddies who spend their days and nights at the local rowdy watering hole. The bar's owner informs them that he may have to close down because the greedy bankers holding his lien have jacked up his payments. The bankers are really trying to force the bar into foreclosure so that they can used the area for other ventures. The bar's closing doesn't sit well with Harley and Marlboro. In an effort to help their buddy, a scheme is concocted to rob the bank of $2.5 million. The duo lay in wait and rob the bank's armored car. The pair soon realize that the vehicle contains a new designer drug called "Crystal Dream" instead of the money. The bank's crooked president Chance Wilder (Tom Sizemore) uses the bank as a front to deal drugs and demands his shipment back. Harley and Marlboro are unsure what to do about the drugs or how to unload them. It isn't long before both the bankers and mob discover the identities of the robbers and come calling. Chance calls in Alexander (Daniel Baldwin), a brutal assassin who works for the bank. Alexander and his band of thugs engage Harley and Marlboro in to a number of violent confrontations. As the bullets fly, Harley and Marlboro rely on the good graces of friends to help the hide. In the end the pair face off with Alexander in a confrontation of the ages. Harley Davidson and the Marlboro Man is currently available to watch and stream, buy on demand at Amazon, Vudu, iTunes online.